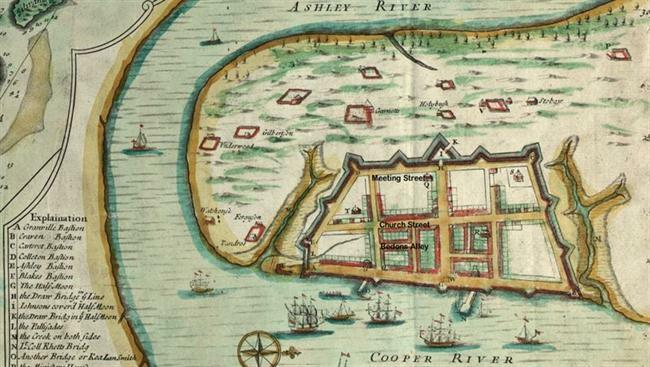 The 1711 Crisp Map shows Vanderhorst’s Creek (M), Granville Bastion (A) and Ashley Bastion (E) connected by a palisade across the narrow tributary, and Colleton Bastion (D) north of Meeting Street. The original plan for Charles Towne laid out a grid of streets and building lots on the peninsula. Salt-water creeks and marshes cut into several areas of the planned town. Two deep tidal creeks ran inland from the Cooper River, Daniel’s Creek and Vanderhorst’s Creek. Known since the late eighteenth century as Water Street, Vanderhorst’s Creek separated Church Street from White Point, the southern tip of the peninsula. It flowed across Meeting Street and extended beyond the west side of King Street. Smaller streams drained into Vanderhorst’s Creek from both sides. The shallow south branch was controlled as a tidal basin by the early eighteenth century, but the long arm that ran northward between Church and East Bay streets remained an open creek until the mid-1750s. In the early eighteenth century, a belt of protective fortifications enclosed the Charles Towne settlement. The southernmost wall was placed inland of Vanderhorst’s Creek, and featured bastions at each end: Colleton’s Bastion to the west and Ashley’s Bastion to the east. As the city grew, the earthen walls along Vanderhorst’s Creek and Meeting Street were abandoned and dismanteled. 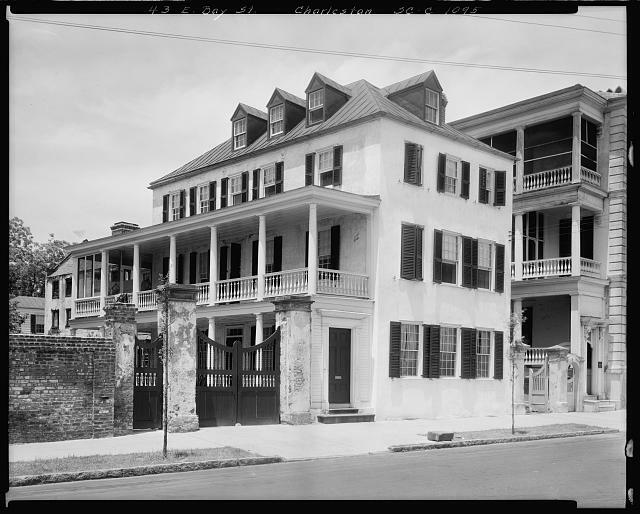 During the War of Jenkins’ Ear (1739-1748), fears of an attack on Charleston led to another system of defenses, which relied heavily on earth and wood construction. The great hurricane of 1752 wrecked those walls and fortifications. Charleston’s defenses were rebuilt between 1755 and 1757, with new works designed by German military engineer Major de Brahm for Charleston’s Commissioners of Fortifications. In May, 1756, de Brahm ordered the line between Granville’s Bastion and Broughton’s Battery to be built level with the height of the “Flood-Gate newly constructed.” Under the roadbed of today’s East Battery, this floodgate managed the tidal flow into Vanderhorst’s Creek, controlling the stream as a thirty-foot wide channel deep enough for boats. For at least part of its length, the creek was lined with brick walls. With Vanderhorst’s Creek confined, property owners were encouraged to fill the tributary creek between Church Street and East Bay Street. 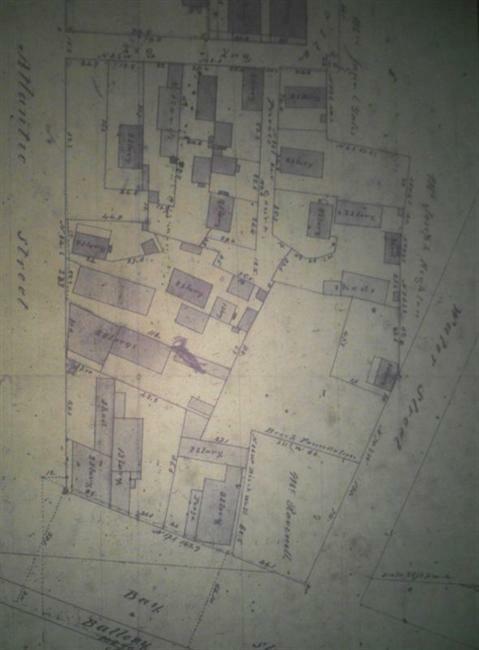 As the block south of Tradd Street developed, two small east-west footpaths became established alleys, Longitude Lane and Stoll’s Alley. 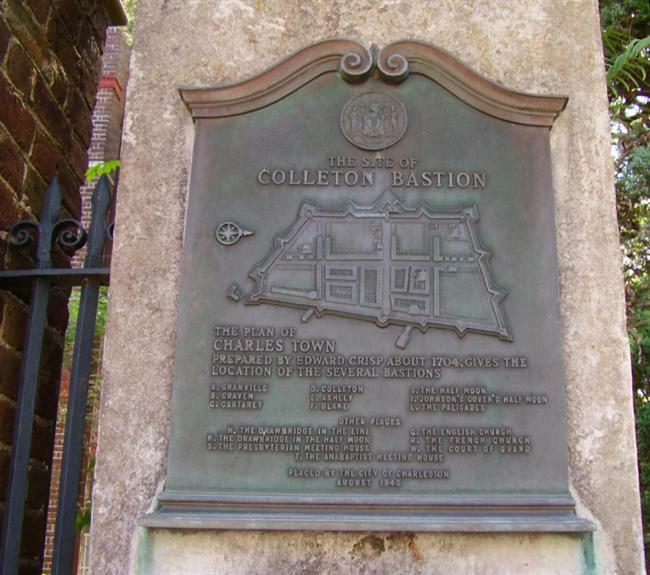 From the mid-1780s into the nineteenth century, Charleston’s political leaders engaged in a difficult effort to extend East Bay Street south to the tip of the peninsula. The work eventually led to the conversion of Vanderhorst’s Creek into Water Street. As late as December, 1795, the legislature was wrestling with how to collect payments, and hearing petitions from citizens claiming losses by the road’s being continued through their lots. Finally, in order to complete the work, in October 1798 City Council approved a special three-year tax assessment to cover funds already spent, and agreed to raise an additional $6,000 through a lottery. Water Street had been created gradually. Sometime after the Revolution, Vanderhorst’s Creek/canal was filled between Meeting and Church streets. 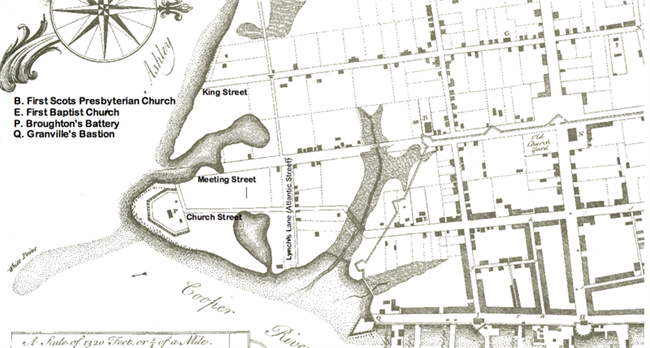 By about 1784 it was known as Water Street. The east block, below Church Street, was finished more slowly. 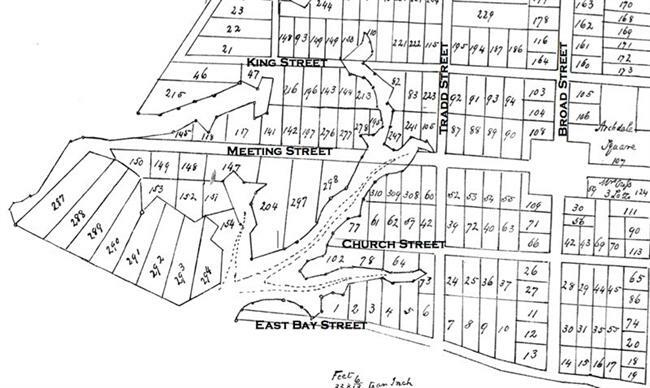 A 1798 plat of the Somers property (43 East Bay Street) depicts Water Street, and marks the area north of the street “shoal land dry at low water.” Only after final construction of East Bay Street and the seawall in the early nineteenth century was Water Street dry at high tide. Charleston Times September 10, 1804. Bates, Susan Baldwin, and Harriott Cheves Leland, eds. Proprietary Records of South Carolina. Volume Three: Abstracts of the Records of the Surveyor General of The Province, Charles Towne, 1678-1698. Charleston: History Press, 2007. Stockton, Robert P. “Discovery unlikely part of walled city.” Letter to the Editor, The Post and Courier, September 19, 2006. A twentieth-century reconstruction of Charleston’s original plan shows Vanderhorst’s Creek and its branches. Church Street terminated at the creek. Bishop Roberts and W. H. Toms, The Ichnography of Charles-Town at High Water. London, 1739. 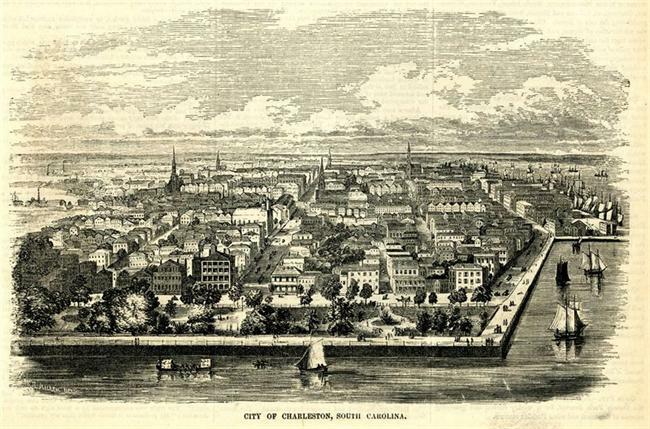 This 1855 view of Charleston from the south shows East Bay Street extension (East Battery) and East Bay Street. 43 East Bay Street in 1937. 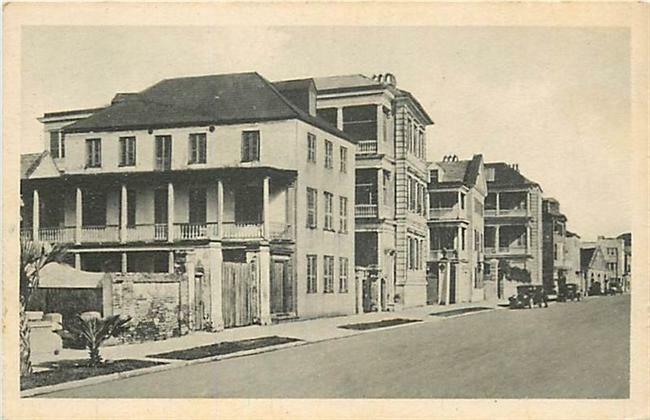 “Along East Bay at Stolls Alley.” Early 20th century postcard view shows 43 East Bay, 45 East Bay, 47 East Bay, and 51 East Bay Street. 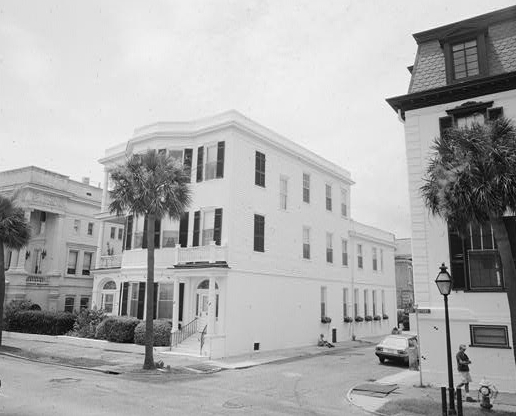 Ravenel’s house at 31 East Battery was later the residence of George D. Bryan, mayor of Charleston from 1887-1891.